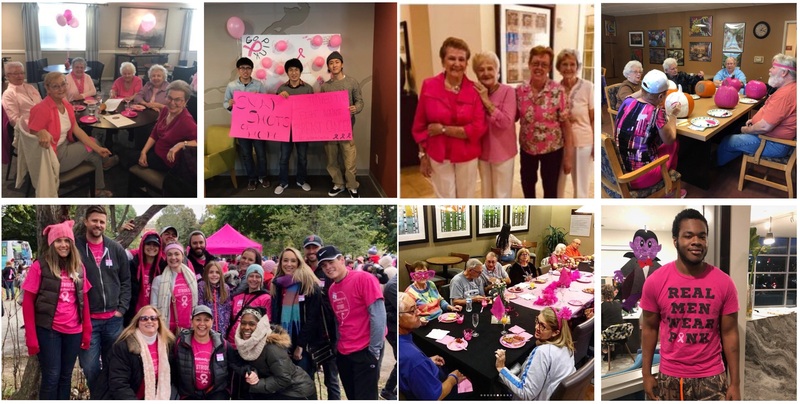 The United Group of Companies, Inc. (United Group) was eager to once again raise money and spread awareness during the month of October for Making Strides Against Breast Cancer. Properties in New York, Florida, Georgia and Colorado, as well as the corporate office, all proudly participated in the noble cause; creating and hosting exciting and unique events to help spread awareness and raise money. Glenmont Abbey Village, an independent senior living community in Glenmont, NY, raised the most money company-wide with $600 in donations. The community hosted a very well-attended Fall Festival and Pink Cocktail Party, and generously donated all the proceeds from the two events. United Group awarded the “Best Property In Pink” to Sandalwood Village, an independent senior living community in Naples, FL. Their “THINK PINK PARTY” recognized cancer survivors who are living at Sandalwood Village. Survivors received a pink carnation and were honored by the entire community. The corporate office also played a major role in reaching the company’s fundraising goals, by participating in the Making Strides Against Breast Cancer Walk in Albany, NY. Employees could also donate to the cause for an opportunity to wear jeans to work for the entire month of October, and partake in a balloon pop raffle for a chance to win personal time off, gift cards and free lunch. With United Group’s relentless pursuit to create a positive and lasting impact on local communities, the company looks forward to continuing their efforts to raise awareness for breast cancer in the coming year, as well as support other noble causes.